My mother, a generous, conservative, Christian widow gets far too much mail asking her for a bit of her social security profits. While she was in the hospital I cleaned up all the piles of mail she had on the kitchen table, coffee table, ironing board and in the cupboards, closets, and dresser drawers. The volume of mail had overwhelmed her. She tried to give to every organization that asked it of her. I haven’t found any records of her giving over $10 to any one group, but that amount seems to be enough to get you on everyone’s lists. Some of the mail is just too remarkable not to be shared. I’m not sure if she’s been calling Mom’s doctor every few days to get an estimate on the date she’ll expire or not. But she’s not just sort of wondering when it’ll happen. No. She’s waiting for it. I’ve never received this piece of mail so I guess she doesn’t care if I live or die. Apparently adding something like this really gets the attention of old ladies. They like to know that someone cares enough to do something just for them. So they open the piece in gratitude. 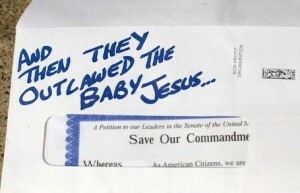 Or perhaps they are just curious to see how well the sender understands how much they love kittens. Will this personalized envelope have a picture of my recently deceased Fluffermuffin? Mom didn’t fall for this one. I found this envelope unopened. These next guys tried harder. The Law Enforcement Legal Defense Fund (LELDF) wants you help them to get Stephanie Mohr back home to her little boy. 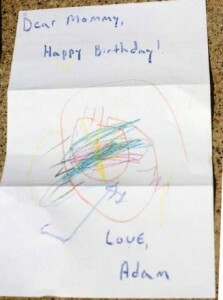 See the birthday card her son drew for her? Isn’t that worth some money? Not enough? Also included is a photo of little Adam. My mother thought he was cute and is saving his picture. But she wasn’t persuaded to send money. That’s a good thing because LELDF really doesn’t care that much as you might think. According a source quoted by snopes.com, the fund spent about 18 cents of every dollar collected on defending police officers such as Ms. Mohr. Now someone’s getting creative. 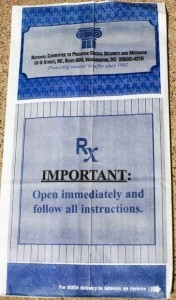 But it’s a really cheap trick to get an older citizen to open your request for money by counterfeiting a prescription drug envelope. Come on guys. At least try to play fair. This group and others have my mother convinced that medicare is going to end within weeks. Her memory is failing, but she remembers to ask me every week if I’ve read anything yet about Medicare or Social Security payments ending. She scans the newspaper for the terrible news every day. It must be inevitable. 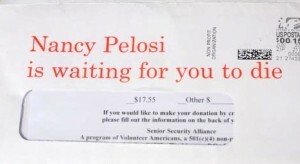 Every third piece of mail she receives says so. There must be twenty groups like this one, with similar names. The fixed income senior market is easy prey. Now I don’t understand why one-third of Mexicans illegally crossing the border go directly to the New Orleans area, but you see the evidence right there. I’m also confused about the quotes around “Borderline Disaster!” Are they trying to be facetious? Or maybe many undocumented immigrants have borderline personality disorders? Mom didn’t fall for this one either. She’s a sucker for disabled veteran groups, though. I now review all her mail, so don’t get any ideas. Oh K — this is so sad and so funny, all at the same time. Thanks for horrifying and enlightening and making me laugh. Transplanting my comment from FB! You know, I’m outraged at this crap, but at the same time, I’m laughing at the inanity of it. Good thing you’re keeping an eye on the situation!